Miami, FL (March 12, 2018) – MBF Loan Director, Michael Sellinger, served as a judge at the Knowledge of Careers Second Annual Social Impact Pitch Night as part of the Genius Project. The Genius Project, which is a collaborative program among Knowledge of Careers, Genius Factory and Overtown Children and Youth Commission service providers in which VCM facilitates weekly STEAM-E engagement and exposure opportunities in connection with the #ThursdayGathering. 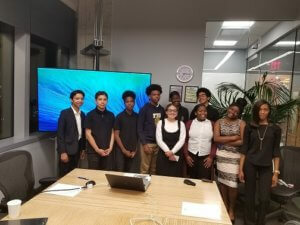 During Social Impact Pitch Night, 10, amazing high school participants competing for prizes and bragging rights pitched ideas for potential social impact enterprises.